When I started out blogging about 6 years back now, I had one thing in mind – what is this blog going to be about? After a lot of deliberation and thinking, I could just come up with one thing – whatever runs through my mind. The basic objective of this blog is to let me write, something that I inherently enjoy, and in parallel if it helps others in any which manner (maybe by the occasional laughs alone), I would die a happy man! After spending my entire working career till date in FMCG, it is more, but apparent that I should write something about it. I am a marketing person at heart, and am sure would remain so. Yesterday morning, in my conversation with A, an interesting insight was revealed. Every FMCG item is now eyeing to come up in a jar. Traditionally only toffees came in a jar and rightly so, it needed some place to be sold out of the pan outlet where it is generally sold from. I remember last year in feb, bubblegum sales was not really picking up, and then a new variant was launched in jars. The sales zoomed, much beyond the demand that was estimated. What difference does a simple jar make to a product which remains the same? Similarly, parle biscuits. Traditionally parle biscuits are low priced sku’s meant for a quick bite. It was apparent that a Rs. 5/- sku comes in the market. (a 3/- sku is also doing rounds). After the initial launch of this magic figure 5 priced sku too, the visibility aspect of the product was not very high. 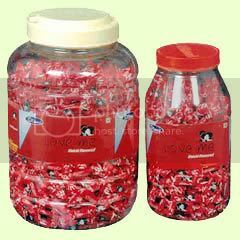 And as they say in sales (especially in impulse category products like chocolates, biscuits, chips, etc..) “ Jo dikhta hai, who bikta hai!” Parle sales suddenly started zooming upwards, and again just with a small interference – jars! Biscuits in jars you may think? Yes! This is what provokes the retailer in storing ( and displaying) the product in the front. Why is this phenomena? And why are companies willing to spend that extra on jars? Simple. More acceptance among the retailers. Higher volumes can offset the marginal price increase that would be borne for the jar. Also, the perceived value of the jar among the retailer is much higher than the actual cost of the jar to the company. So, it is a complete win-win situation. The retailer looks at the sku as the inherent products as well as the jar. for instance, if a candy costs Re. 1/-, and the margin to the retailer is 10% i, the company, would have to give him a jar of 100 candies at 90/-. (90.9/- actually depending on mark up or mark down!). The retailer does not see much benefit in selling it, and bargains with me for more in-built frees (like 100+8 free units at the mrp of 100/-) and stuff. Now the same sku, filled in a jar turns the dynamic completely. The retailer now looks at the margin of 10%, and also the price in which he can sell the jar( or maybe how much it would cost hi if he were to buy a jar for his outlet to stock something!). The perceived value of the sku instantly goes up, and there, the salesman has a winning story. Also, the company realizes that the jar is like a permanent branding the company manages to get in the retail outlet even after the contents of the jars are empty. I, as a brand manager, would love to see my product jars being filled with other items too and stocked in the outlet – I save huge money on posters and banners, which anyways have a minimal shelf life! Of late, many more categories like sunscreen, setwet hair gels, ponds cream, wafer biscuits are all now in their avatar of jars. Would not be too long, before condoms also start selling in jars! Nice piece!!! First jar of condoms will surely get delivered to you!!! Who is this other “A” in the blog/post? there is no other “A”. both the A’s are being referred to the same person!!! it is THE A! Condoms in JArs? Arey India ka population already jyaada hain bhai !!! isiliye to.. it is all the more important for condoms to be easily available!!! It’s always a relief when someone with obvious exisetpre answers. Thanks! I love that you’ve battling a problem and contributing to employment, something that’s desperately needed right now. Somehow I’ve missed you so far in this blog challenge, but I look forward to having a minute when I can read through what you have written so far. Good luck! And, I’m laughing about the Argentinians…something about the way you wrote it.Kimberly recently posted..